The film is very well represented on home video, but some releases come with caveats. This is another extremely grim early turn from Hitch, focusing its unflinching gaze on public schoolboy Roddy Berwick’s grossly unfair fall from grace, being cast out into the wilderness and – spoiler alert: ultimate redemption. Hitch’s fourth film, Downhill was retitled When Boys Leave Home is the US, though When Boy Leaves Home would have been more accurate. That is, unless it’s a general screed against the dangers of sending your kids away to boarding school and the horrors that can befall them, to which I can personally attest. Although I didn’t get accused of knocking up any comely wenches, nor did I inherit a fortune, fall under the seductive power of an adulterous, gold-digging actress or become a gigolo to wealthy, dissolute older ladies. Unfortunately. It’s based on a hit West End play, Down Hill (different spelling), which the prodigously talented Novello also co-wrote and starred in. I’ll be honest: the plot, such as it is, barely qualifies as even wafer thin, and has holes you could drive a coach and horses through. One would certainly expect better from one of the Great British Playwrights. What’s more, there are hardly any wholly sympathetic characters at all, not even the star of the piece. The only ones who don’t display any personality flaws are a handful of bit players who aren’t on screen long enough to do any wrong. But even two of those are painted quite poorly: a stereotyped black man and woman, cast as ‘simple Negroes’. Even worse, the latter is a blacked-up white woman. It’s not somehow germane to the plot, as in a similar example in Young and Innocent; they just didn’t bother to get an actor who was naturally the right shade. Conversely, the film is often incorrectly lauded for featuring a sympathetic “transvestite” in a role that’s not inherently derogatory, as one of the few folk who show kindness to poor, beleaguered Roddy. In actual fact, that part is played by admittedly somewhat masculine-featured but definitely female Violet Farebrother, who went on to also appear in Easy Virtue and Murder! There may be trouble ahead… Ivor Novello still on top of the hill with Sybil Rhoda. Spanish Divisa Blu-ray. Downhill has a reputation as being a bit of an anomaly for Hitch. Though showing occasional flashes of inspiration, it’s frequently accused of possessing mostly workmanlike and sometimes even boring, predictable direction. Many consider it turgid, ponderous, perhaps his least artistically successful silent and a likely contender for worst British Hitchcock. Pam over at Silent London gets straight to the point with the travails of Roddy, and it’s hard to disagree completely with the slightly tongue-in-cheek forum posters here and here, who all echo the general consensus. But the constructive critiscm of C. A. Lejeune, longstanding film critic for The Observer, really nailed its shortcomings in her contemporary review. However, I’m going to go out on a limb here in brief defence of it. I hadn’t seen the film for a good few years and was inclined to agree with the above viewpoints. On revisiting it recently in preparation for this article, I went in with my expectations suitably lowered and was pleasantly surprised. Yes, the storyline is simplistic in the extreme and the denouement is unseemingly swift and oh-so neat, but what the hell, it still gets to me. The ending reminds me somewhat of Chaplin‘s The Kid (1921), and nobody’s criticising that. My advice is to look on Downhill as a cinematic tone poem, where the overall mood is more important than a discernible, gripping narrative. On that level, I think it succeeds magnificently. Roddy and Mabel (Annette Benson) shot oh-so-artfully having a fun little jig. But it’s her and randy Tim who end up dirty dancing the horizontal tango in Ye Olde Bunne [in Ye Oven] Shoppe. Yes, it’s a spoiler. Spanish Divisa Blu-ray. Ultimately, Downhill‘s biggest failing is that it’s directed by Hitchcock. Really: if it had anyone else’s name attached and wasn’t saddled with the overwhelming expectation of genius, it would be considered a significant British silent but without caveats. As it is, the bar is set so high for anything he’s involved with that it can’t possibly live up to it. But even if you do turn out not to be a fan of the film, don’t hold it against Hitch: with dozens of solid gold nuggets to his name he’s certainly entitled to hit the odd bum note. Indeed, many of his films, especially those made under more compromising conditions before he’d consolidated his star power in the mid-1930s, turned out much better than they had any right to be. Fun facts: Sybil Rhoda, who played Sybil Wakely, sister of Roddy’s friend Tim and an initial prospective love interest, also appeared in two other silents prior to Downhill: Sahara Love and Boadica. She was still going strong at the age of 101 and interviewed here and here. She can also be seen in Starlings of the Screen (1925), a Stoll Film Company promo short, which appears as an extra on the BFI’s BD/DVD set of Asquith’s brilliant Shooting Stars (1927). Ever since its first release, Downhill has only been available in B&W but the 2012 Hitchcock 9 restoration, transferred at 20fps, revives its beautiful original tinting scheme. This includes an infamous, long-unseen lurid green sequence denoting mental and physical sickness. A few scenes that were never tinted remain in B&W. “The original negative of Downhill does not survive so the restoration was based on two vintage nitrate prints – one from the BFI’s own collections and one on loan from the EYE Film Institute in the Netherlands. There was some compensation in working from original prints held as they had their original tinting and toning so that we have been able to restore the colour that Hitchcock used so expressively in his silent films. The restored version has an HD release in four countries to date; even more than The Lodger. And it gets three newly recorded piano scores to boot, in addition to one it had just a few years prior. The older transfer used on all pre-restoration DVDs is in jolly (hockeysticks?) good shape but only B&W and runs at a slightly-too-fast 24fps, equalling 82min on the PAL DVDs, with their additional 4% speed-up. Mabel unfairly fingers Roddy for the dastardly deed. L-R: Annette Benson, Robin Irvine and Ivor Novello. There are some differences between the three BDs’ restored transfer. Criterion’s colours are noticeably deeper and more saturated than the French and Spanish. You’d never know without doing a side-by-side comparison but I prefer the latter two, as Criterion’s richer palette comes at the slight expense of shadow detail. The BFI decided 20fps was the optimum speed for their restoration, equalling 105min. The French and Spanish stick to it, while for some reason Criterion chose to run their transfer slightly slower, at 109min. Lastly, all three BDs have different but equally adept new piano scores. Criterion’s Lodger disc (region A) easily wins overall, by virtue of its extra film and copious extras. As for the Euro BDs, Divisa (region B) has the ubiquitous The Early Years featurette (1999, 24min), a slideshow and several text-based extras. Elephant Films (region 0) has similar extras on all five of their Hitch BDs: the aforementioned Early Years, two film intro and Hitchcock 9 featurettes with Jean-Pierre Dionnet (both in French, 9min) and a short picture gallery. But the French also has unnecessary, unforgivable burned-in subs. Therefore, Spain comes out on top for the film itself. There are comparative screenshots of several Downhill transfers here and here. The overwhelming majority of quality silent film home video releases have professionally recorded custom scores, but very rarely some are let out without any score whatsoever. Granted, silents are a niche market, often with little to no profit involved and everything often done on a shoestring budget, but there’s really no excuse for not even including a relatively cheap and perfectly acceptable piano accompaniment. 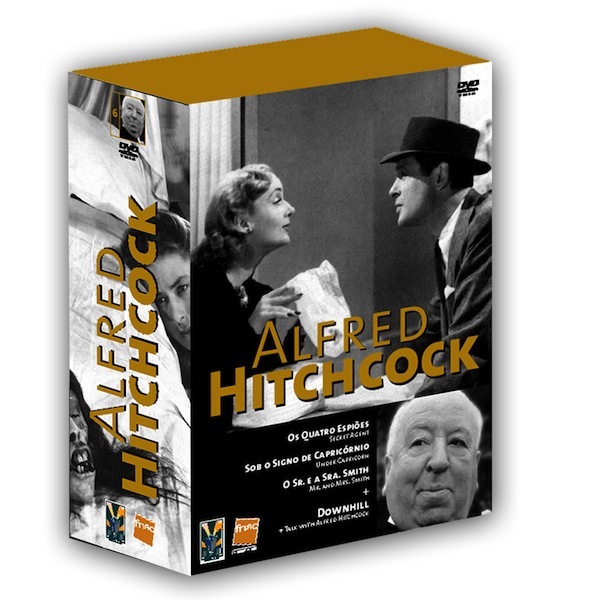 Hitch is a little unlucky in that a few discs of his films – most of them for Downhill – have been released sans score, but they’re all noted so be guided accordingly. If you do acquire one of the scoreless DVDs and are casting around for suitable accompanying music, I recommend trying Mozart’s String Quartets; they always worked for me. Downhill‘s 2012 restoration première was serenaded by a new 5-piece acapella score composed by classically-trained UK beatboxer Shlomo. If that sounds like an ill-informed choice, fear not: it was actually surprisingly good and, for the most part, entirely appropriate. Here’s an artist interview including Bryony Dixon, a glowing review and a selection of video clips from a later performance. For good measure here’s an informative review from Paul Joyce, prolific author of the consistently excellent ithankyou blog. Unfortunately, at this point in time Shlomo’s score looks fairly unlikely to ever show up on a commercial release. A second piano score was also commisioned from John Sweeney, who performed it live several times and completed a studio recording. As shown above, so far it’s only available on the UK-restricted digital version and the latest French discs. Oo-er! Rodders baulks at the prospect of raunch (gulp).